You will commonly find the slow motion effects in music clips as well as in movies these days as it helps to make unique impression on videos and it also highlight the specific details that can otherwise be missed off. 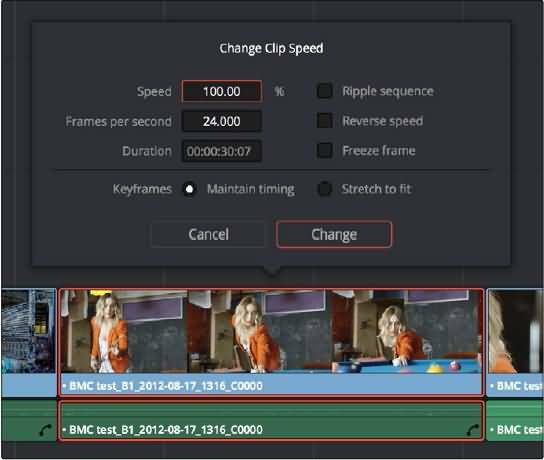 There are 3 different techniques to adjust speed of the clips: It can be done using inspector, using Retiming effect on timeline and by simply changing the speed dialog. The article below will help you to achieve slow motion effect with ease on DVR window. Step 1: Add your desired video files to timeline of FilmoraPro. Step 2: Right click on the timeline to choose Speed/Duration. See, it is much easier to make a video faster or slower in FilmoraPro. You can also play video in reverse and improve the aduio quality. Download it now to have a try (Free)! Those who are interested to develop slow motion type clips or want to reverse it, speed it up, develop freeze frame effect, they can use change speed dialog to complete all these tasks immediately. First of all you have to right click on Timeline and then from drop down menu, select Change Clip Speed option. Now use various controls to edit the speed change dialog. Change speed to parameters: It helps to change the speed of selected clip by any desired percentage. One can also make changes on the basis of duration and frame rate etc. Ripple Sequence Checkbox: When you are ready to adjust the speed changes then you are about to ripple your timeline. It is essential to push or pull clips along with the current clip so that new clip size can be easily accommodated; finally you need to turn on that checkbox. Reverse Speed Button: If you click on this button, it will help to set the current speed for navigate value while reversing the overall motion of clip. Freeze Current Frame Checkbox: It helps to change the entire clip into a freeze frame. Maintain Timing/Stretch for Radio Buttons: If you choose the first option on DVR then it leaves various keyframes inside clip at original position whereas with stretch keyframes option you will be able to crop, transform and composite keyframes and they will be compressed by same level. Adjustment for speed parameter will also affect their links simultaneously. If you are working with slow motion videos then it is essential to make changes on the basis of 50% or 25% whereas FPS as well as duration will also get affected. In case if you wish to speed up the selected video then change this speed parameter to 100%. It is also good to access ripple sequence checkboxes as per need. This feature helps to push everything back for entire duration. It is time to check your slow motion effect and then find best parameter for video. In case if results appear jerky then it is good to shift towards another method. This method extends a convenient control on overlays so that clips can be easily adjusted on timeline. It can also manage the controls for variable speed effects. Step 1: Simply right click on your clip and then choose retime clip using contextual menu. Step 2: Now you have to adjust the Retiming for entire clip. The best technique to apply this effect is to change play back speed for whole clip. In order to generate slow motion effect it is good to stretch clip for its retiming. Step 3: Now adjust the clip speed arrows. If you drag them to the left it will fast forward and in case if you want to return to normal speed of this clip then simply use pop up next feature from bottom portion of clip. Select reset to 100%. In order to close the retiming control, select clip, press Command +R or choose retime controls from available options. Step 1: Choose your clip and open the inspector. Now go to video tab. Step 2: Scroll down to scaling group and retime. Step 3: Change settings on scaling group and retime to get desired results. Retime Process: It helps users to select a default technique for clip processing with mixed frame rate type timelines. The fast forward as well as slow motion effects are evaluated one by one for every clip. In the default settings that fall under project setting category, all the speed affected clips will be treated with same procedures. You will find here three options: Optical flow, Frame Blend and Nearest. Scaling: It helps users to select clips that are mismatched to current resolution of project. The project settings work as default settings here so all clips are treated with same processes. One can also process clips with personalized settings for stretch, fill, fit and crop. Nearest: Most easiest technique where frames are either duplicated for the slow motion or they are dropped for fast motion. Frame Blend: Best when optical flow shows unwanted artefacts. It helps to generate smoother results by simply dissolving fast motion or slow motion effects together. Optical Flow: Results in highest quality where new frames are generated for normalizing slow and fast motion effects. Scale full frame with crop: It helps to crop excess pixels from clips. Scale entire image to Fit: This is default setting for DVR and it scales all different resolution in such a manner that they can fill up whole frame without cropping. Stretch Frame to all corners: Best for projects containing anamorphic media. It helps to stretch clips having different resolutions so that they can match all frame sizes. Watch the video below to check how to make a slow motion video in DaVinci Resolve 12.5 with details.